Many misguided Africans are brave when it comes to disrespecting other Africans, but are sheep when it comes to standing up to their oppressors. AFRICANGLOBE – South Africans are the strangest people one can come across on the African continent. Most of them think they are better than Africans from other parts of the continent. For example, they call their fellow African brothers and sisters “Grigambas” and “Makwerekwere.” They never refer to Europeans and Asians by these derogatory names. The Mail & Guardian of 1st February 2019 published an article about a four year old boy, Sinoxolo. Sinolo, whose mother is a South African, was detained with her Congolese paternal aunt Irene Malumbu at a repatriation centre in 2004 and died shortly after falling ill. His aunt Irene Malumbu was not illegal in South Africa. It is just that she did not have her residence permit with her when the police demanded it in Johannesburg. This has never and will never happen to a white boy and his white aunt irrespective of the fact that they are illegal in the South Africa. Recently, a structure collapsed and killed about four white school kids. This was tragic. The MEC for Education Panyaza Lesufi rushed to the school in Vanderbijlpark about 50km west of Johannesburg. A hurriedly arranged media conference was called and broadcast live on television. When five and six year old African school kids have been falling into pit latrines, Lesufi has neither rushed to those schools nor hurriedly arranged a media conference. About five years ago food inspectors in Zambia took off the shelves GMO foodstuffs from South Africa’s Shoprite stores in Zambia. Those GMO foodstuffs included Bokomo cereals such as corn flakes, bananas, apples and chicken. Yet the South African government does not protect its citizens from consuming these poisonous foodstuffs. Furthermore, the South African media did not report about the Zambian authorities’ swoop on South African produced GMO foodstuffs, a story that was all over the news in Zambia. 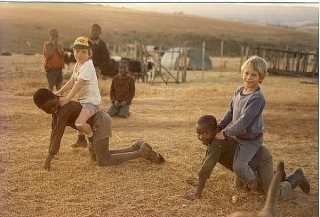 Africans in South Africa rely on white people for their food security by virtue of the fact that white people own vast tracks of land which they usurped from the African people. Moreover, they have a monopoly on the South African economy including agricultural production. It is the same white people who produce the poisonous GMO foodstuffs to feed to Africans in South Africa and neighbouring countries. This is genocide and at the same time altering the African people’s genome. Eugenicist leading spokesman Bertrand Russell wrote, “Gradually by selective breeding, the congenital differences between rulers and ruled will increase until they become almost different species.” He continued to write, “A revolt of the plebs would become as unthinkable as an organised insurrection of sheep against the practice of eating mutton.” This can also be done through GMO foodstuffs and vaccinations. Most South Africans who regard themselves as better than other Africans on the continent do not understand the dangers of GMO foodstuffs. The ANC government under Thabo Mbeki’s presidency had signed the Africa Growth Opportunity Act (AGOA) with the US government whose fifteen year period elapsed towards the end of Barack Obama’s term of office and he coerced the South African government to renew it within three months. He gave the ANC government a three month ultimatum to renew the AGOA trade agreement under duress one of whose terms was to buy US chicken which Americans themselves do not eat because of the way it is produced. The South African government was right to frown upon a demand by some western countries that President Cyril Ramaphosa act on corruption or risk losing future foreign direct investment. However, on the West’s encroachment on our sovereignty, the South African government is cowed. Why is the South African government not acting likewise when it comes to economic and political decisions imposed on it by the West? Instead of coming together and fighting their common enemy, Africans in South Africa are torn asunder by rivalries and greed. They behave like mongrels that have a bone thrown in their midst. They are fighting for power because it gives them access to public resources. There has been rampant corruption since 1994 whose details are emerging in various commissions of inquiry that are held concurrently since late last year. A white opposition politician Helen Zille recently suggested that she would initiate a tax revolt should those implicated in corruption not be charged. Her comments stirred up a hornet’s nest of angry opposition and criticism from radio, television, newspaper columns and editorials. Her comments were described as irresponsible. Do people no longer believe Evelyn Beatrice Hall’s dictum, “I disapprove of what you say, but I will defend to death your right to say it”? However, this aphorism does not apply to senseless and insensitive comments that colonialism benefited Africans. One would have expected Zille’s detractors to respond that those implicated in corruption be charged and a tax revolt would not be necessary. By the same token, Julius Malema’s criticism of the newly appointed National Director of Public Prosecutions (NDPP), Shamila Batohi , that he was close to Public Enterprises Minister Pravin Gordhan and President Cyril Ramaphosa and was therefore not going to charge them should have been treated the same way as Zille’s comments. Malema should have been told that it would be unacceptable for Batohi to be selective in her prosecutions and that if she felt too close to Gordhan and Ramaphosa, she should recuse herself in cases that involve them. South Africa has had a useless prosecuting authority that it is inconceivable that Batohi would repeat her predecessors’ corruption. Malema also claims Gordhan has a bank account in Canada with the Royal Bank. If he does not have it then Gordhan should prove Malema wrong and sue him. The ANC government is not yet prepared to heed the call to depoliticise the civil service. The hierarchisation of the National Prosecuting Authority and law enforcement agencies is a problem because the National Director of Public Prosecutions has the power to stymie or expedite cases as has been shown by Batohi’s predecessors. For the South African Police Service to prosecute, they should first take their cases to the NPA in order to decide whether or not to prosecute. The law must be applied equally. The whip must crack on corrupt officials and politicians; those responsible for Sinoxolo’s death must be prosecuted and people should be free to express their views even if we disagree with them. South Africans should jettison their colonial and slave mentality. Next articleThese 4 Businesses Are Owned By Black Women. Support Them!